Sooooo..... here's my latest hoodie, a pink, kawaii-style upcycled Old Navy hoodie, with cupcakes and hearts and everything. It's in my etsy DaisyDreams shop. It took me several hours to make, but it was worth it. It's extra-super soft and awesome. I keep thinking I should keep these for myself, but again, my hoodie collection is far too large as it is. More to come... two days till the weekend! I've come to the realization that I have an unfortunate hoodie addiction. I have roughly 57391138362520.3 of them in my closet. At least 3/4 of them are in various shades of gray. Many of them come from thrift stores, and they still look awesome. I wear them whenever possible. Anyway, I stopped by a new Salvation Army the other day, and I found a lovely NIU Huskies hoodie for $2, which was awesome since I went to NIU and my last hoodie from there died a year ago, and the ones at the bookstores cost $50. This one is a dark gray, with red satin words and white embroidery. It's awesome quality, and the only defect was that one of the metal rivets for the hoodie string had fallen out, so I used my magical hoodie-fixing skills and removed the other one. Now both side are equal, and I have a great hoodie. 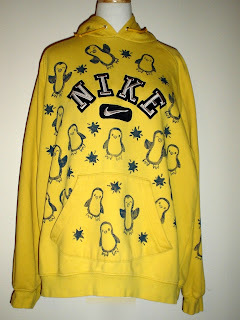 Then, I had a magical moment of truth in which I realized that the thrift store is full of awesome, once-but-no-longer-loved hoodies, often with only a few small stains being the reason for their heartless abandonment. And, I realized that I can block print them, thus covering the stains. So I went crazy and bought four of them. The first one I made today, a lovely way to spend a Sunday morning (and part of the afternoon). 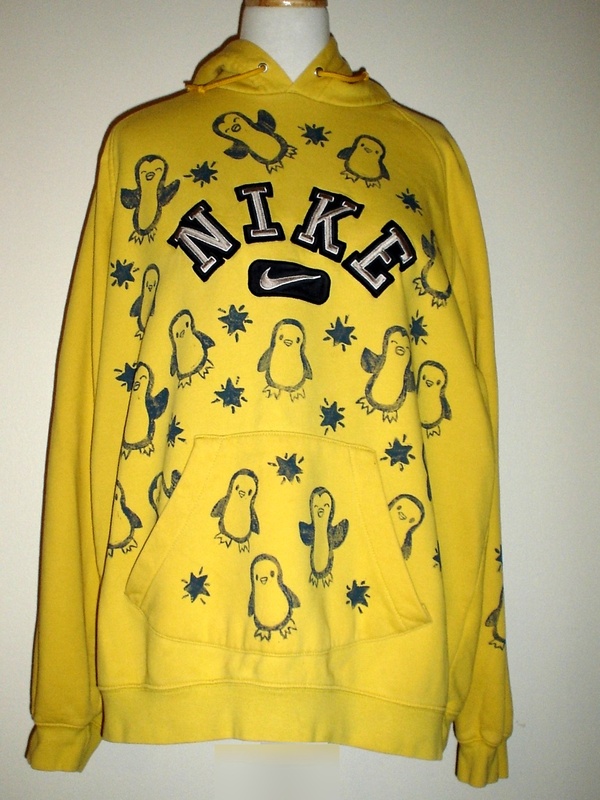 It's a very high quality, bright yellow, cotton Nike hoodie in size L men's (no tag, but it's bigger than my M Huskies hoodie). It's got a blue and silvery logo. It had some paint stains on the pocket. I covered all the paint stains with block printed penguins and stars, and am quite happy with the results. I wanted to keep it myself. maybe if no one buys it, I'll do just that. There are still some VERY faint marks on the sleeves that I couldn't capture on camera because they are so light. Looks like some pen lines or something, but so, so faint it's barely visible. Lovely Swoosh on the hood, too! All-in-all, a great and happy hoodie. You can see more pictures, or purchase it in my etsy shop Daisydreams / Dylan Mars And Riley.